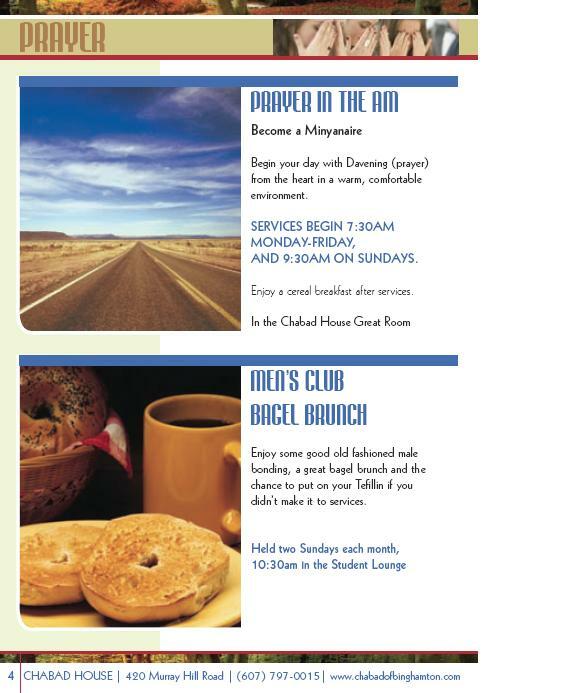 Aside from all our special events, we have programs offered on a regular basis to spice up your week and add meaning and excitement to your month. 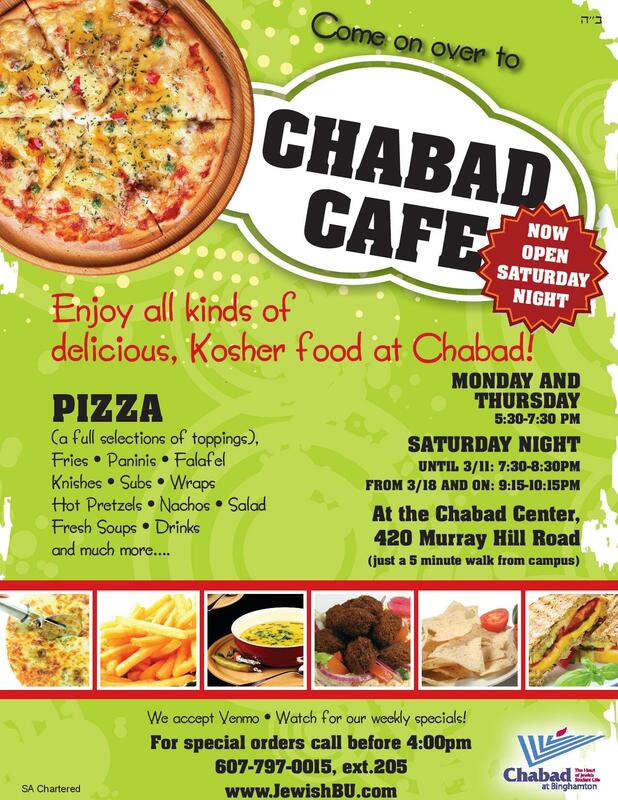 Pick up the most delicious slice of Kosher Pizza at Chabad Cafe nook on Mondays and Thursdays 5:30 - 7:30pm, plus enjoy the assortment of falafel, paninis, knishes, subs, fresh soups, salad, fries, drinks and much more. Don’t miss Chabad’s annual Go-Karting and Ski Trips for the ultimate fun experience. 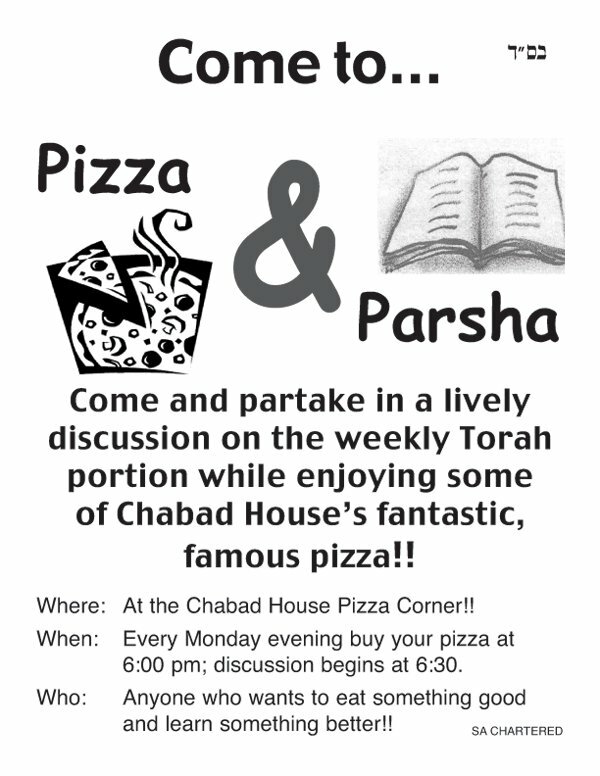 Monday Evenings 6:30pm you can get a slice of the Parasha along with your Pizza and some really great discussion with Rabbi Lewin. 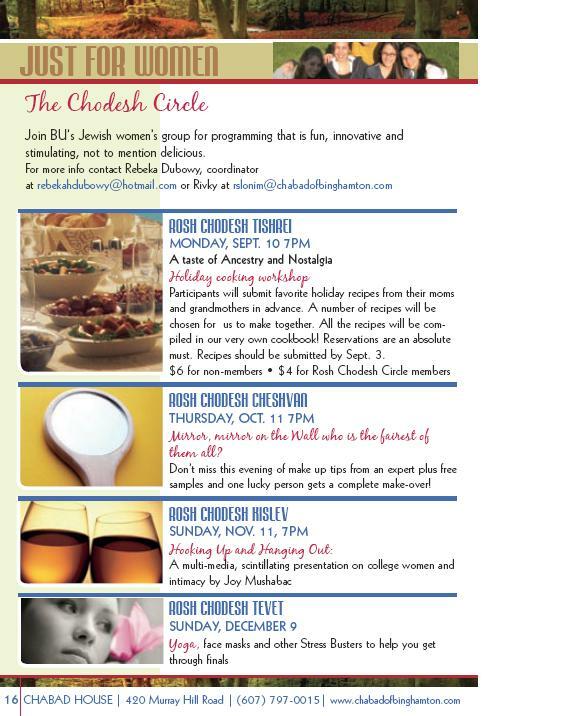 Each semester, Chabad brings you world class speakers on topics of diverse interests. Some are funny, some are serious, all are mind expanding and make for an extra special Shabbat experience. Each Tuesday you can spice up your lunch hour with some great “soul food” served hot by Rabbi Lewin in the Kosher Kitchen. Think you go to enough classes and lectures? Think again. The most important lessons in college are gleaned outside the classroom. 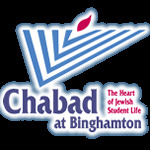 Chabad brings you guest speakers each semester that can make a real difference in your life. 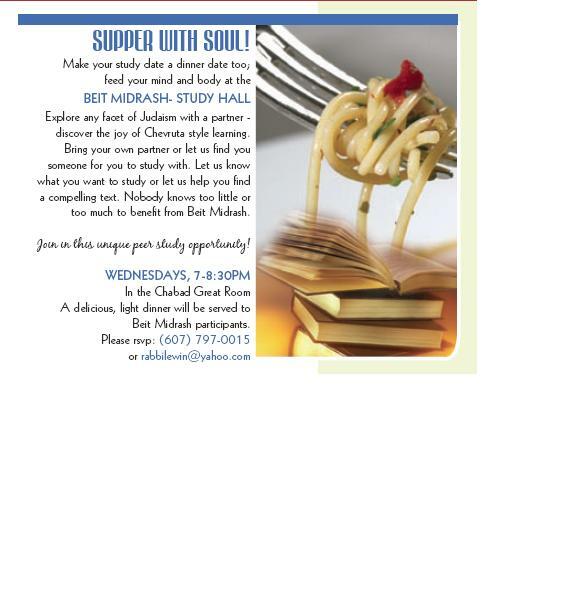 Every Wednesday, enjoy a free, hot delicious dinner and then engage in peer study, Chevrutah style. You choose the subject, we provide you with the materials and books. Find a buddy or come alone and we’ll pair you. Chabad’s Café rocks the house with a great assortment of coffees, pastries and sizzling games or entertainment. Don’t miss these evenings of great fun twice each semester! Every other Sunday the guys get together after Minyan for some good old fashioned male bonding over bagels and shmears. Each semester Chabad strives to bring top names in Jewish entertainment to our campus. Matisyahu, Blue Fringe and Soul Farm have all played here, and Marc Wiener, Richard Morris & Avi Liberman are among the comics who performed at BU, to name a few! Watch for upcoming attractions! To celebrate the new Jewish month, BU’s girls get together for an evening of bonding games, great snacks and a special activity or guest presenter. Don’t miss these great times. Finals are here but don’t think the programming for the semester is done. Hundreds of students turn out for the delicious breakfast served at midnight one night during finals week. Madness? Sure. But why miss it?. Who says Jews don’t play? Join Chabad’s intramural sports teams and have a blast. Jazz, sizzling ribs, and lots and lots of Jews all jammed together in the oversized Chabad sukkah makes for a memorable celebration! Chabad students visit the sick in area hospitals and the elderly in area facilities or their homes. Join the group of volunteers who make these visits part of their weekly routine and see how enriching the experience can be. The New Year for Trees is celebrated in style with a Seder featuring mystical teachings and a large assortment of fruits and nuts plus chocolate fondue! What a great way to end the year- a bon fire, BBQ, music and chillin out with friends. This elegant evening showcases the talent of Jewish women on campus. The program includes song, dance, music, poetry, drama and art and great food, of course!